Hummingbirds are the ultimate backyard birds, but they thrive in a wide variety of habitats beyond the typical landscaped suburban backyard. These are diverse, adaptable birds that can be found in a wide range of climatic and ecological zones, and understanding hummingbird habitats can help birders know where to look for these flying jewels in the field as well as plan a better backyard oasis to attract hummingbirds at home. Like all birds, hummingbirds can only survive in an area that meets their basic needs for food, including both insects and abundant nectar, as well as fresh water, shelter, and safe nesting sites. With more than 325 hummingbird species in the world, these tiny birds face a lot of competition for appropriate habitats, but many hummingbirds have evolved to take advantage of only small portions of individual habitats with their bill shape and length, overall size, wing shape, and flight behavior. In this way, many different species of hummingbirds can coexist in the same rich habitats. The greatest diversity of hummingbird species is found in areas where plant life is more diverse, which in turn leads to more diverse insect life—both plants and insects are critical food sources for hummingbirds. Elevation also plays a role, and while hummingbirds can be found from sea level to as high as 14,000 feet above sea level in the Andes Mountains, mid-level elevations have greater plant diversity and therefore greater hummingbird diversity. Hummingbird population and diversity surveys have shown that tropical regions closer to the Equator have a greater abundance of hummingbird diversity. Ecuador, with its diverse ecological zones and varied habitats crossing the Equator—is the most varied spot for hummingbirds in the world, with more than 125 hummingbird species recorded in the country. In North America, the western part of the continent west of the Mississippi River has great ecological and climatic diversity with grasslands, multiple mountain ranges, deserts, canyons, and even lush tropical zones. This leads to more hummingbird species in the west, while the ruby-throated hummingbird is the most common species east of the Mississippi River. As more hummingbird lovers offer feeders and design their landscaping specifically with hummingbirds in mind, however, more species are regularly appearing as hardy vagrants in the east, and some have begun to overwinter there in recent decades. Tropical areas of southern Arizona, southwestern New Mexico, and southern Texas show the most diverse hummingbird populations in the United States. Food: Hummingbirds feed frequently to support their high energy nutritional needs. 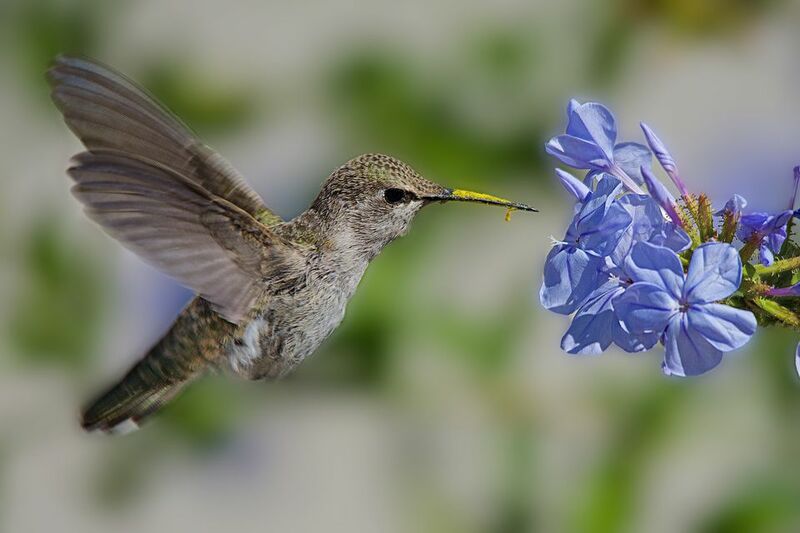 Plant flowers that attract hummingbirds with abundant nectar and specialized blooms for these birds to feed, and minimize the use of insecticides so there are plenty of small insects available. Adding colorful hummingbird feeders also gives the birds a rich, reliable source of supplemental food. Water: A traditional birdbath is too deep for hummingbirds. Instead, create a shallow puddle augmented with a mister or dripper to keep the water fresh and flowing, and provide water for hummingbirds in shaded areas with broad leaves for the birds to rub against to bathe. Shelter: Thick trees and shrubs are essential for roosting hummingbirds to stay safe. Thorny bushes provide extra protection from predators, and choosing plants that serve double duty with nectar-rich flowers will help attract even more hummingbirds. Nesting Sites: Hummingbirds are not cavity-nesting birds and will not use birdhouses, but they will nest in appropriate trees and bushes. Adding a supplemental nesting area such as a Hummingbird House (not really a house at all) can entice nesting hummingbirds to visit, as can providing fine cotton fluff for the birds to use to build their nests. Ideally, keep your hummingbird habitat as natural and native as possible. Avoid invasive exotic plants, and strive to have a hummingbird-friendly backyard for as long as possible with plants that create long-lasting blooms at different times of the year. Just as hummingbirds are more plentiful in diverse natural habitats, the more diverse your backyard habitat is, the more successful it will be for attracting hummingbirds. Habitat conservation is critical for protecting all hummingbird species. Creating a backyard habitat can nurture local hummingbirds as well as provide a rest stop for migrating hummingbirds, but if those migrants have nowhere safe to go, your efforts could be useless. Supporting conservation programs in tropical regions where hummingbirds are most diverse is critical for preserving these beautiful birds, and many birding organizations such as the American Bird Conservancy, The Nature Conservancy, and the National Audubon Society work to preserve habitat in many areas where hummingbirds thrive. By understanding hummingbirds’ habitat needs and knowing what makes a good hummingbird habitat, it is possible not only to enjoy these birds close by but also to ensure their survival throughout their widespread ranges.